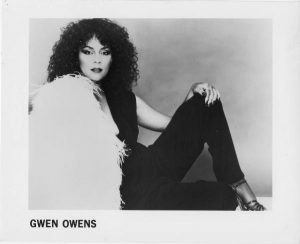 After some attempts to get in contact with Gwen, we finally got in touch and she was more than surprised that Hot and some songs are still very popular in the soul / disco scene. Especially in the UK, Hot is a perennial favorite. 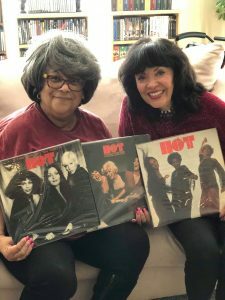 Asked when the fans can expect a release of HOT’s three albums on CD, Gwen says, “The material is at Atlantic and it’s up to them whether the albums are released on CD or not.” Unfortunately, all outtakes and tapes from this session are no longer available. 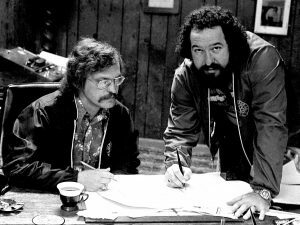 Producer Terry Woodfort eventually decided to destroy them, as the storage of the tapes in the respective rooms was simply too costly. That means, the only remaining master tapes are in the archives of Atlantic, so at least one hopes. Gwen started singing in high school. “There was a sponsorship program in which I sang. Someone who sponsored this program was also recording in a recording studio and asked me what I did after school. I told him nothing and he just said, very well, then you can come to the studio after school. “The first recording was” Mystery of Love “followed by” Mystery Man “(1964). After that there was “Just Say You Wanted (And Needed)” and “I lost a good thing”. All songs are still very popular in the Nothern Soul scene. 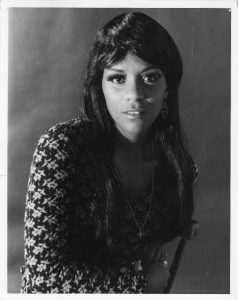 At the beginning of her career she only sang songs by male singers, like Wilson Pickett and Otis Redding, because she did not want to be compared to other female singers. “Just to avoid anyone telling you, oh your sound is like that of singer X or Y. As female role models, I had Aretha Franklin, Tina Turner, Etta James, and Gladys Knight. I covered a lot of James Brown, my favorite song was cold sweat. My cousin and sister were my backup dancers in my performances. We had this one gig in a club and I wore high heels and danced like crazy. Suddenly I slipped and during the next beat I was back up again. Of course, people thought it was part of my performance, why would a woman dance like this with high heels in a very long dress on a slippery floor? It was unbelievably fun for those who knew it was not part of my show. 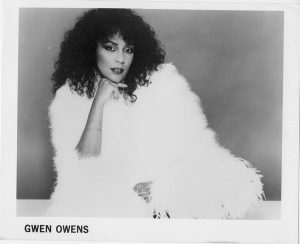 ” The single “Rain” / “Lies”, which is in many lists stated as a single led by Gwen Owens, was not sung by her. “Weldon Mcdougall who has released the song must have made a mistake,” says Gwen. “It’s definitely not my voice, unfortunately now the whole world thinks the single is mine, which it definitely is not. There are so many songs I have recorded over the years and many songs that I can not remember … But I can clearly say that it’s not my voice. I do not know who the woman is and if she is still alive, but I certainly do not want any credit for songs I did not record. ” In 1968 she recorded the singles “Make him mine” and “One more day”. 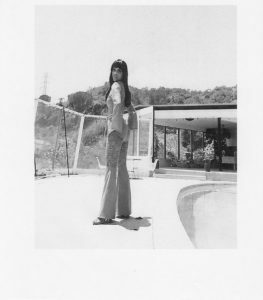 Followed by more singles she recorded until she moved to California in 1971. “That’s where I recorded at Muscle Shoals Studios, where I also met producers Clayton Ivery and Terry Woodford, who also produced my song” you better watch out “. Clayton tried to sign me with a label when he suddenly got a call from Motown. He asked to build Motown South together with Terry. And when he signed up with Motown, he suggested me as an artist and I was in it. I insisted, however, that my contract only lasted over 6 months. Motown had a habit of contracting artists for 7 years and then doing nothing with them. And you can not record for anyone else, since you have a long-term contract with Motown. We did not search for material, but had recorded other songs besides “you better watch out”. The were completely finished and would only have to be published. The problem with Motown, however, was that they had so many artists with so much material that they did not even manage to release my stuff. So, after 6 months I asked to be released from my contract. 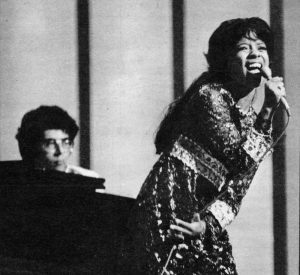 At that time, Ivery and Terry were still under contract with Motown South. The Motown South Project did not really do anything. When their contracts extradited to Motown, they called me and asked if I did not want to come back and I said to myself, why not. At that time, they brought my songs to Casablanca and Casablanca signed me. Finally Casablanca released “You better watch out”. When asked what happened to the rest of the songs, Gwen laughs. 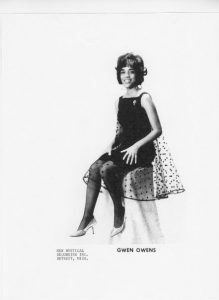 “I have no idea, you know, I’ve recorded so many songs over the course of my career, eventually you lose track.” Producer Terry Woodford still remembers a title “Cross My Heart” which was also recorded by Gwen but never released.. After the release of “you better watch out” it got quiet, concerned Gwen`s solo recordings. “I worked as a background singer for Ann-Margret, Jose Feliciano, the O’Jays, Lou Rawls, Nancy Sinatra and Raquel Welch, among others. 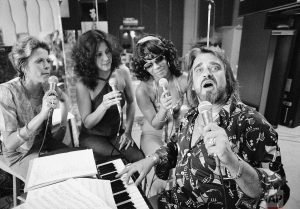 Ivery came back to me in the mid 70’s, so I did the backing vocals on the Wolfman Jack tour with Cathy Carson and Irene Cathaway. 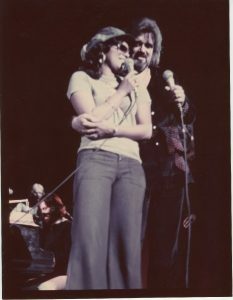 Wolfman Jack 1975. Working with him are, from left, Cathy Carson, Irene Cathaway, center, and Gwen Owens. Shortly thereafter, Terry and Ivery called me for a new recording session and I told them right away that there would not be any solo recordings, but that I would bring along two singers. They only said you will never be part of a group. I wanted to prove the opposite, and I did. Therefore they wanted us three in the studio. Just then, Irene decided to go on tour with another singer. That meant Cathy and I were alone in the studio. That proved no challenge for either Ivery or Terry, as they initially only wanted to record with me. So we recorded 4 songs and with these 4 songs we got a contract with Big Tree, which was a sub label of Atlantic. ” As the first single, the label decides not for an up-tempo song, but for “Angle in Arms”. Unfortunately, the demo for “Angel in your Arms” does not exist anymore. As Terry Woodford has a special memory of this demo. “The 16-track Tape of the Country Demo had a crack right in the middle of it. All we had from the demo was the title and a line of lyrics. So what we did was to add a new piano track, guitars and bass section to the song, including rewritten lyrics. Only the drums remained from the original. Gwen asked her producers if they were really sure that “Angel” should be the first single, followed by a unanimous “yes”. Gwen says today that she never expected the song to be such a big hit. “After the song was released, the label wanted to have a finished album as soon as possible. At the same time, we were hoping to find a third member for the group. We had no idea what cultural background the singer should have. Irene was Mexican, but we did not necessarily look for a Mexican again. We were sitting at our manager’s office when we all accidentally looked out the window and watched a woman walking across the street. I also do not remember what she was wearing, but her look was just amazing. Ed our manager just said if she is coming for the audition and sing can sing, she gets the job, she just looked amazing. You know how the story ends, after we were complete as a trio, we went back to Muscle Shoals to finish the album. Juanita Curiel, who joined as the third member, can not be heard on the original version of “Angel in your Arms” but on the Spanish version of the song. As she was not yet a member of the group when the first version was recorded. I do not remember who had the idea, we learned that Juanita does not speak Spanish because we were hoping she could translate the song. That’s why there were suddenly about 9 translators in the studio who translated the song for us. 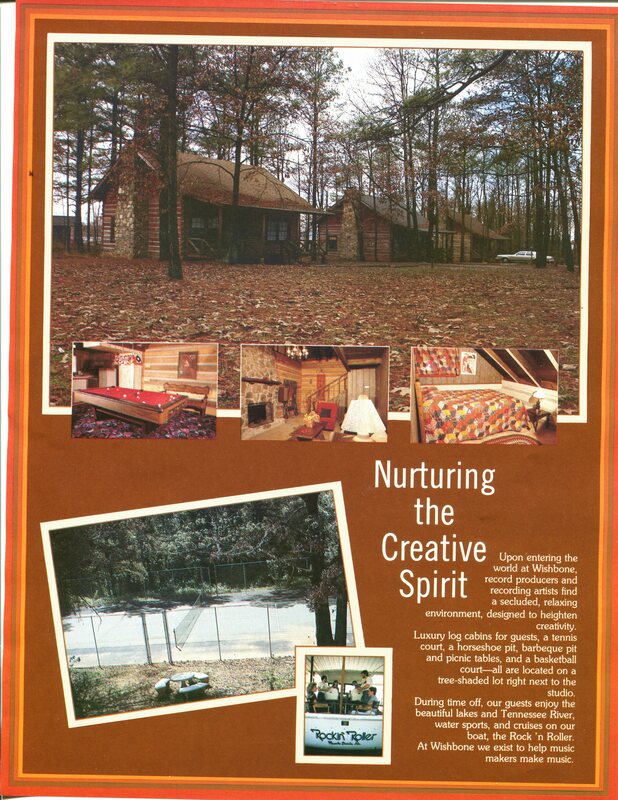 ” When asked how Terry came to all the translators in Alabama in the 1970s, he said, “We have announced what we are looking for and many people came to the studio. It was exciting for them to be in a recording studio. At the time, HOT had a big hit and was HOT in the truest sense of the word. I still remember that the line “While you’re out of paintin ‘the town” made the most translation problems. Because this is a proverb. We paid everyone who helped $ 50. People did not do it for the money, but because they had a blast. After all the recordings for the first album were completed, we then made the Spanish version. After the release of the album, we went on tour and did some TV shows. We had to record the albums so fast, we did not really have time to enjoy it. Before we knew it, we were back in the studio to record the second album. ” When asked how we can imagine the time in the studio, says Gwen, “You know, there were a lot of songwriters there and everyone was trying to get their songs on our album. We listened to the demos and I talked to Terry and Clayton. It did not matter which songs I chose, because they were all good. I’ve played them and tried to figure out which songs I can feel good with. Then the musicians recorded the backing tracks, we had no influence on the arrangements. The things we could control were the lead and background vocals. We have all made background vocal arrangements for all our albums. At first I just went to the studio and recorded the background without consulting the producers. I thought I would go beyond the limits if I just do it without talking to them first. So there was a difference of opinion and the next day I waited until I should sing. The result was that I just heard, what are you waiting for? Sing the background! From then on, everyone understood that we knew what we were doing. 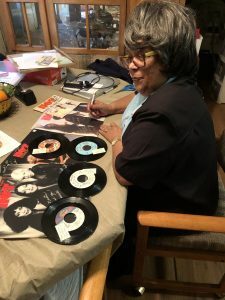 ” As a woman in the 70s it was not easy in the music business. Not only that everyone thought the group would be like many groups and compiled solely for commercial reasons. “No, it was a coincidence how we came together and we were one of the first multicultural groups. 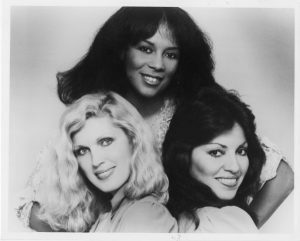 And yes, we had to fight for our rights, especially Juanita had a hard time getting her songs on the albums. A few of her songs made it on our albums, but trust me, it was a tough fight to even consider our songs. ” Gwen also has two songs on the first album, including “Why don`t you believe in your man” and “If you don’t love her” (The story behind this song, can be found in Part 1) That’s how we got respect, we showed them that we’re not stupid women who had no idea in which key we had to sing, etc. We were very good educated musically and we knew how to write songs. ” Why was there no follow up after three strong albums? Gwen says, “I do not know if I should tell you this story, but it was so long ago, why not. A singer at Columbia recorded the same song as a singer at our mother label Atlantic. And something happened back then that there was a legal dispute between Columbia and Atlantic and their respective singers. The singer who recorded at Atlantic, it was her first record, we were very sorry, because it would have been a hit. The song was also a hit for the male singer at Columbia. During this dispute, however, everything that stood at promotion etc was stopped by Atlantic. This in turn led to a dispute with our producer and the Executive of Atlantic. The end of the story was that we were released from our contract. Therefore, there was no follow up after the three albums. So, whenever you hear that an artist has quit a contract for some unknown reason, the artist is mostly innocent of that fact, it’s the managers, the record bosses, etc., who decide on your career, not the artist himself. 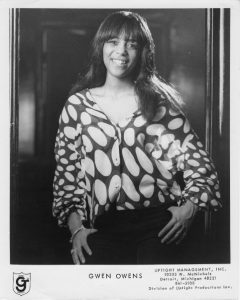 This lawsuit also buried the singer’s career at the same time.” Why did she record solo material in 1979? “Our manager told our producers to record these songs. They did not tell the others girls and I should come to the studio and record my vocals to the songs. I suspect that they wanted to alienate me from the group to make me a solo artist. There was no reason for that. There was never a bad word in the group, or any other problems. Anyway, I recorded the songs, but I did not even know they were released until the day I saw them as a single some years ago. ” When asked what she remembers from the 1980 movie, Gwen says, “I know that the script for the movie was done before we even talked about it. At first, the movie was only about two singers, then they expanded the script to 3 singers when we came into movie. ” Why is there so less video recordings of HOT, Gwen wonders. She remembers being in many TV shows. 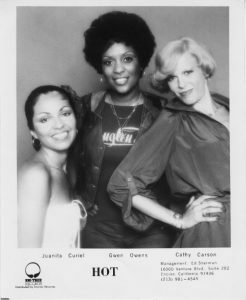 The next thing you hear from HOT dates back to 1982 and for a long time it was not clear if this was really a HOT single, or if only, as shown on the label, Juanita alone was involved in the recording. This is the single “Tonight” / “The Nights Are Not Enough”. Gwen confirms that this is a Hot single as both she, Cathy and Juanita have recorded this song including the B-side. (There are more demo songs from these sessions, which we have already covered extensively in Part 1 of the Hot Story) Unfortunately, they were also unlucky with the new label Boardwalk. Shortly after signing the new contract, Hot and Neil Bogart’s wife ( Neil Bogart was the owner of Broadwalk ) sat in the briefing room to learn that Neil Bogart had died, but his wife was thrilled with the group. Plans were made, but the New York office stopped everything here, too. They had to figure out, how it should go on without the deceased boss. Because all the contracts with the bank and the lenders were with Neil and not his wife’s. “The next thing we knew was that Broadwalk was closing and we were back without a label, where we could hardly wait to record a new album. 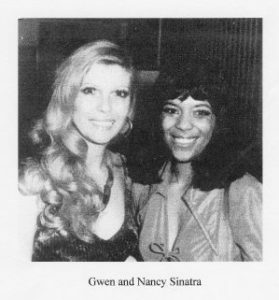 Cathy left the group and Juanita and I continued to record songs like “Home Again” by Phyllis Brown and “Woman to Woman”. (The song Woman to Woman is available on the album Hot Uncovered via cdbaby). With these and other songs, we then tried to get a new record deal. We replaced Cathy with Cathy Ornelas.